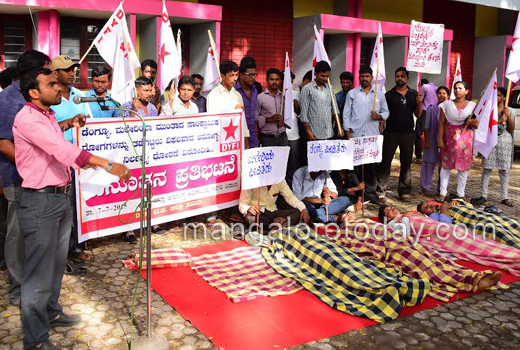 Mangaluru, July 8, 2015: The DYFI went on a protest against the District Health Officials who have failed to control the spreading of dengue, malaria and H1N1 in the District. Some of them slept on the roads in front of the District Health Office in Mangalore. covering themselves with blankets enacting like the people suffering from Dengue and Malaria. The protest was lead by the DYFI leaders, Imthiaz, and Jeevanraj Kuthar. Public participated in large numbers in support of the protesters demanding prompt action against the spreading of the dreaded deceases. MCC Corporator Dayanand Shetty said that in the rural areas such as Puttur, Sullia and Belthangady dengue has affected the life of people. In Mangalore people are afraid of Dengu and Malaria spreading. The situation is so bad that every house there is some one or the other affected with such disease and the officials and people’s representatives are busy giving speeches but not taking any serious measures to eradicate it. 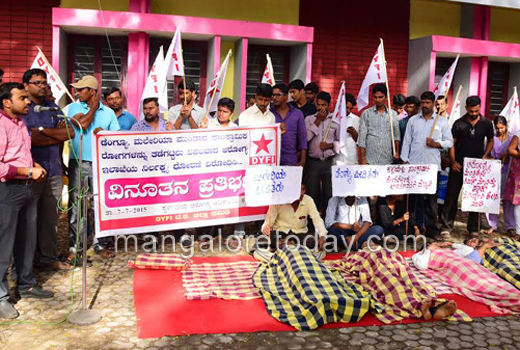 The protest was lead by B.A Imtiyaz, Jevanraj Kuttar, Nithin Kumar, Rafique Harekal and Yogish Shetty.